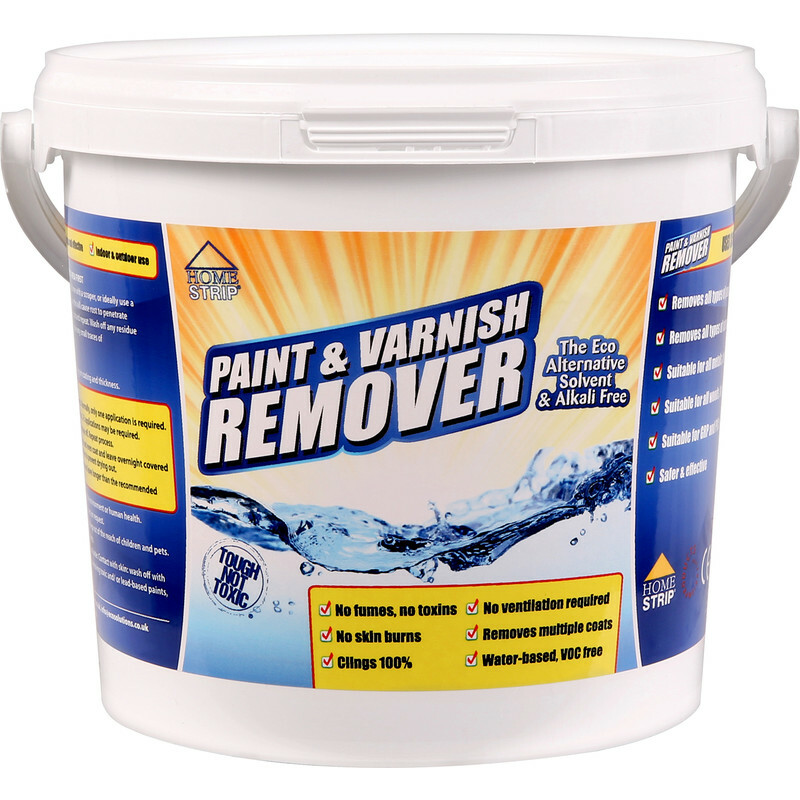 Safer water based alternative to conventional paint and varnish removers. Home Strip Paint & Varnish Remover 2L is rated 3.7 out of 5 by 89. Rated 5 out of 5 by AndyP56 from An excellent product I needed to strip hardened PVA from a wooden floor. The company advised this product would help. It did and made the job relatively easy - apply it with a bruch, leave it for 30 to 45 minutes (have a coffee!) and then scrape away. It's also a very effective paint and varnish stripper, and you don't need to use any PPE. I highly recommend this paint and varnish remover. Rated 4 out of 5 by May4be from Best found over the years We have DIY, periodically, slowly, stripped wood work over the years. I always come back to this stripper. It is not great stripping but this does work and is less harmful than the norm. We have multiple layers of paint on pitch pine. The wood is not discoloured and multiple applications and patience does work (I wait until the paint surface bubbles before trying to remove and often cover and leave overnight). Good luck. Rated 5 out of 5 by M G K from Bought a second one Bought this product having seen a similar produce demonstrated on YouTube. Non toxic water based with a pleasant smell that's far superior to the old well know toxic alternative still on the market and that does an equally good job. I have just bought another one to strip varnish from another garden chair prior to repainting it for interior use. Rated 5 out of 5 by CandJP from Great Product This product was recommended to us. We used it with trepidation as it was a new product we hadn't used before. The results were very pleasing. Removing layers of old varnishes from an antique table, we only had to do one application it worked much better than we expected, so good in fact that we could wax the table once everything had been rinsed and dried, with no need to sand too. As it is water based and environmentally friendly it definitely ticks all our boxes enabling us to use a product that is helping us to reduce the carbon footprint. The smell was not an obnoxious chemical smell like many other brands. Will definitely be using this all the time from now on. Rated 1 out of 5 by Punch from Not fit for purpose I applied a generous coating to a small area my lounge coving which was painted with plastic emulsion waited 30 minutes and tried to remove the paint. All that happened was it cleaned the paint. I repeated the process and was only able to remove a tiny amount of paint. Rated 5 out of 5 by Whtrac6 from Great Stuff I bought this to strip chalk paint from a wooden unit. Did a great job, zero fumes, kind to surface, worked much better than I anticipated, without having to scrape to hard.